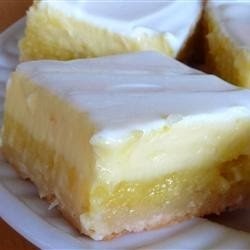 A light lemony cheesecake dessert that makes two layers, one lemony layer, and another cheesecake layer. You'll be coming back for more! Preheat an oven to 350 degrees F (175 degrees C). Lightly butter a 9x13-inch baking dish. Whisk together 4 eggs, 1 1/2 cup sugar, 1 tablespoon flour, lemon zest, and lemon juice in a bowl. Pour lemon mixture into the prepared crust. Skim off any bubbles from the surface of the filling. Mix the cream cheese and 1 cup sugar in a bowl until well blended. Whisk in 2 eggs, then spread over the lemon mixture. The mixtures will separate during baking.